Four delicious muffins ready to brighten any and every dolly's teaparty. 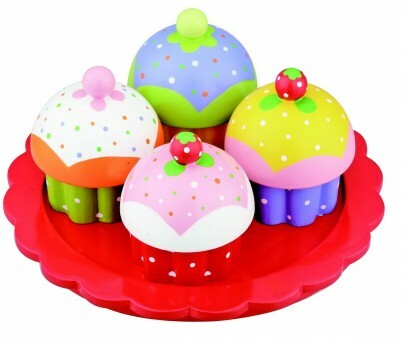 Sitting on their own special plate these colourful muffins are a delight to play with and are a great treat after the dolls have eatten their fruit and veg of cause. 4 colourful muffins and plate included. See our full range of wooden food and treats to build your teaparty.